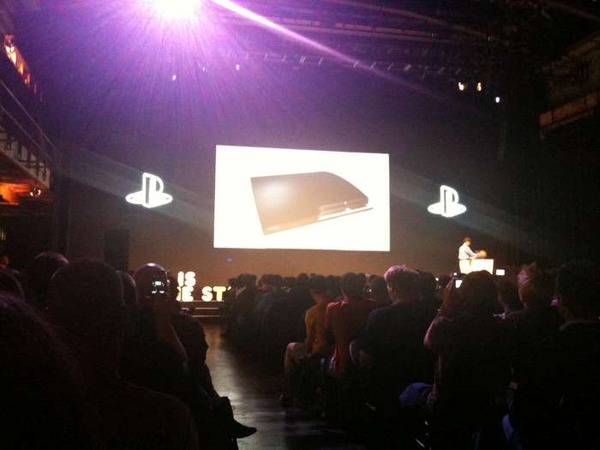 Hardly a surprise, but Sony got on stage today at GamesCom and confirmed what we've all known deep down in our hearts: the new, slimmer PS3 is really real. It'll be out in the first week of September (September 1 in North America and Europe, September 3 for Japan), and will retail for $300 (or 300 Euro, or 29,980 Yen). It's smaller and lighter, has a 120GB HDD, and packs "all the same features" of the regular PS3 while consuming 34 percent less power and taking up 32 percent less space. Existing PS3 SKUs have their prices dropped a hundie apiece tomorrow in anticipation, so be sure to grab a space heater while you've still got a shot -- though we're not sure why you'd pay $300 for an 80GB PS3 when you can wait a couple weeks and get 120GB in a cuter package. A couple pics of the unveil are after the break. Update: We've got press shots! Check 'em all in the gallery below, and be sure to pore over that to-scale comparo pic up top. 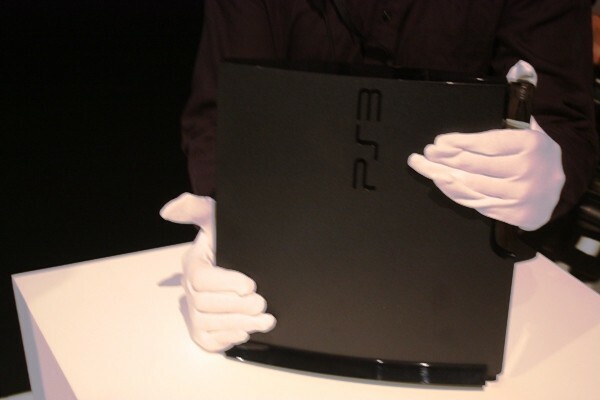 There's one from above as well, which reveals that the new model is actual "deeper" than the PS3 fat. Update 2: Video! 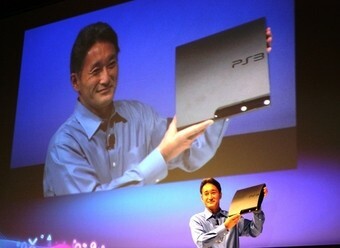 Our main man Jack Tretton talks up and shows off his spanking new slim PS3 after the break. We've also got a full rundown of the specs for your perusal, and added some new information above. TOKYO, Aug. 18 /PRNewswire/ -- Sony Computer Entertainment Inc. (SCE) today unveiled the new PlayStation®3 (CECH-2000A) (body color: charcoal black) computer entertainment system, featuring an extremely streamlined form factor with a 120GB Hard Disk Drive (HDD). The new PlayStation®3 (PS3®) system will become available in stores from September 1, 2009, in North America, Europe/ PAL territories and Asian countries and regions at a very attractive recommended retail price (RRP) of US$299 and euro 299, respectively. The system will become available in Japan on September 3, 2009, at a RRP of 29,980 yen (including tax). With the introduction of the new PS3 system, SCE will also reduce the price of the current PS3 with 80GB HDD to a RRP of US$299 from August 18 and euro 299 from August 19. Also in North America, the price of PS3 with 160GB HDD will be reduced to a RRP of US$399 from August 18. By launching a vast library of exciting and attractive software titles for PS3 this holiday season and offering customers a line-up of hardware models and pricing to match their preference, SCE will build on the momentum and further accelerate the expansion of the PS3 platform. 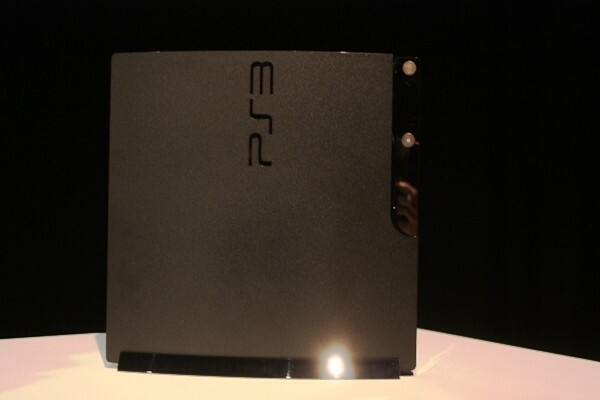 Concurrently with the release of the new PS3 system, SCE will modify the PS3 brand name from "PLAYSTATION 3" to "PlayStation 3", and introduce a new "PS3" logo, which is engraved on the surface of the new PS3 system. By unifying under the familiar "PlayStation®" name, which represents the entire PlayStation family, PS3 together with PlayStation®2 and PSP® (PlayStation®Portable) will further expand the PlayStation business, and will continue to enhance the entertainment experience along with the ever-growing PlayStation®Network. The new PS3 continues to offer the cutting-edge features and functions of the current models, such as the ability to enjoy high-definition Blu-ray disc (BD) movies and games, as well as various content and services downloadable through the network. The new PS3's storage size has increased from 80GB to 120GB, and with the extra capacity users will be able to store more games, music, photos, videos as well as various content and services available through PlayStation Network. Having more than 27 million registered accounts around the world, PlayStation Network offers more than 15,000 pieces of digital content, ranging from game titles, trailers, and demos to more than 15,000 movies and TV shows via PlayStation Store(*1). PlayStation Network members can also download free applications, such as PlayStation Home, a ground-breaking 3D social gaming community available on PS3 that allows users to interact, communicate and share gaming experiences, as well as Life with PlayStation, which offers users various news and information on a TV monitor in the living room by connecting the PS3 to the network. Concurrently with the release of new PS3, system software will be upgraded to version 3.00 on September 1. The update adds various user-friendly features such as the "What's New" screen, where users can quickly browse the new items available in PlayStation Store as well as their recently played games directly on the XMB(TM) (XrossMediaBar), with short cuts to each piece of content. PS3 will evolve continuously with the system software updates, further improving the operability and enhancing the user experience available through the network. PS3 owners will be able to enjoy new features by simply updating the PS3 system software to version 3.00 via the "System Update" function on the XMB(*3). control. Other functions include "System Standby" that will automatically turn off the PS3 system when the BRAVIA TV is turned off(*4). By utilizing the separately sold "Vertical Stand", users will be able to set the new PS3 in vertical position(*5), making it easier to place the PS3 system anywhere at home. The vertical stand will become available in Japan on September 3, 2009, at a RRP of 2,000 yen (including tax) and in North America at US$24(*6). *2 Includes PS one(R) classics and free of charge content (downloadable demos). *5 Users will need to use the separately sold "Vertical Stand" to set the new PS3 in vertical position.